This fabric is a Reproduction Feed Sack Fabric which features a worn look to give the perfect French country charm. To give this fabric that natural look there may be slight imperfections such as thicker slubs or knots in the fabric. 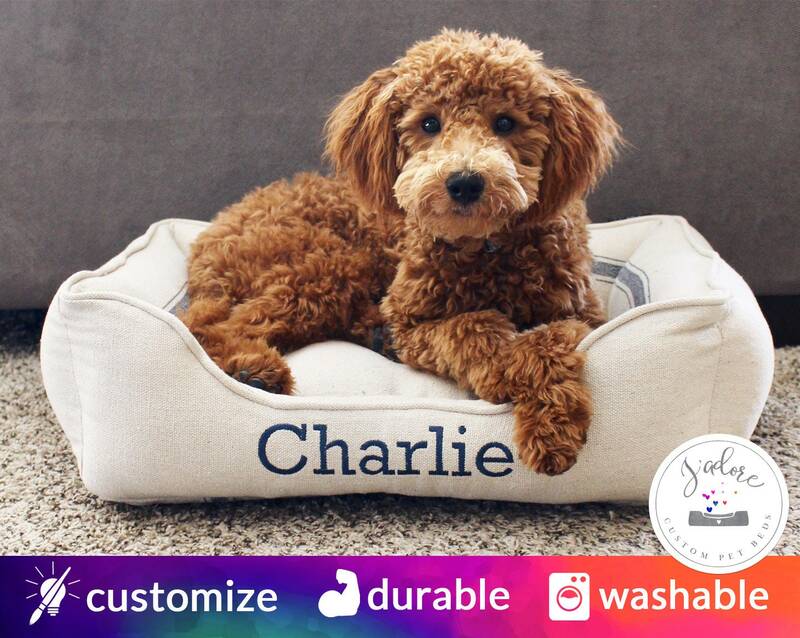 We stuff the seat and bolsters of our Cuddle Bed with the highest quality hypoallergenic fiberfill on the market which is rated to last 3x longer than standard fiberfill. It won't clump, bunch or lose support like cheaper alternatives found in most pet bedding. The seat insert also includes sewn-in channels and a zipper so the fiberfill will stay in place over time and the firmness can be easily adjusted. Our Cuddle Bed is a bed you can be proud to have in your home and under your furry friends’ feet! Our craftsmanship is top-notch which is why every J'adore bed includes a 1-year limited warranty. For more details, please visit our Shop Policies. Heavier beds offer longer-lasting support which is why we guarantee the weight of our beds, and encourage you to compare them against other pet bed manufacturers. Your bed ships free if it ships after the guaranteed ship date. For more details, see our Shop Policies. First off, Alisa's communication was fabulous - and she's a sweetheart to boot! Down to business... my dog couldn't possibly love his bed anymore! It's firm but comfortable, well packed with stuffing that doesn't shift and clump, the bolster is the perfect height for my dog to rest his head, and they're stable enough that he can cuddle up against them to lie on his back without them flopping over. And don't even get me started on the fabric! It's gorgeous. And I didn't know a dog bed could be gorgeous. It suits our 1700s modern farmhouse perfectly and overall is even better than what I had imagined and was looking for. THANK YOU ALISA! My dog absolutely loves this bed!! He loved it so much that I ordered another one for my other dogs. We also ordered the bone shaped pillow which my dog also loves. My dog seems to be so comfortable in the bed and I ordered the second one in heartbeat. The store owner was VERY nice and answered all my answers and was being very helpful. I would highly recommend not only this bed but the store overall. Black & White Stripe Dog Bed with Red Accent | Personalized Dog Bed | Stripe, Bold, Contrast | Ships Fast! Navy Blue Stripe Dog Bed - Navy Blue, White, Stripe, Name Embroidery | Washable, Reversible and High Quality - Ships Fast!